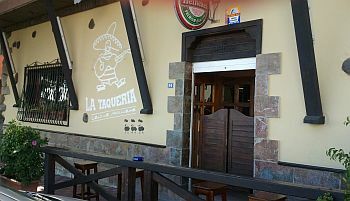 La Taqueria is situated on the main road through the small village of Guargacho. When Alison and I lived in Guargacho, we decided to give it a try, being a bit partial to Mexican food every so often. We weren't disappointed! Rather quaintly, it has the outside appearance of a wild west saloon, with the authentic swing doors and even one of those pole things outside where you tether your horse! 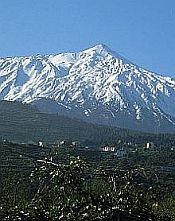 Horses notwithstanding, it is a 15 minute drive by car or taxi, plus a bus service, from Los Cristianos. Once inside, you feel like you've entered a Mexican colony! It is totally theme-based, with a colour scheme drawn from the Mexican flag - red, green and white. Staff are efficient and friendly, though somewhat lacking in their English speaking capabilities. Out of all the dishes on the menu, the one that sticks in my memory is the mixed platter starter. It's a huge plate containing all manner if things, including the best chilli I've ever tasted and a portion of spare ribs in sticky BBQ sauce. I would certainly recommend you to try it. Also, if you fancy trying the ubiquitous Mexican drink, margarita, get yourself a jug, rather than a glass. It works out cheaper. This traditional Mexican cantina comes highly recommended. By me. To find La Taqueria, you need to get yourself to the small village of Guargacho. This can be reached by exiting the TF-1 motorway at junction 26 and following the signs for Guaza. You go through this village (encountering a couple of small roundabouts in the process, but always keeping straight on). Once through the village, after a bit of straight road, you'll arrive at another roundabout. Take the third exit from this (effectively turning left) and you have a long stretch of road. Turn left at the end and this will take you into Guargacho. Eventually, you'll see the restaurant on the left along this road.